Solo and orchestral flute music has some very difficult technical passages that must be worked out carefully in order to be performed well. 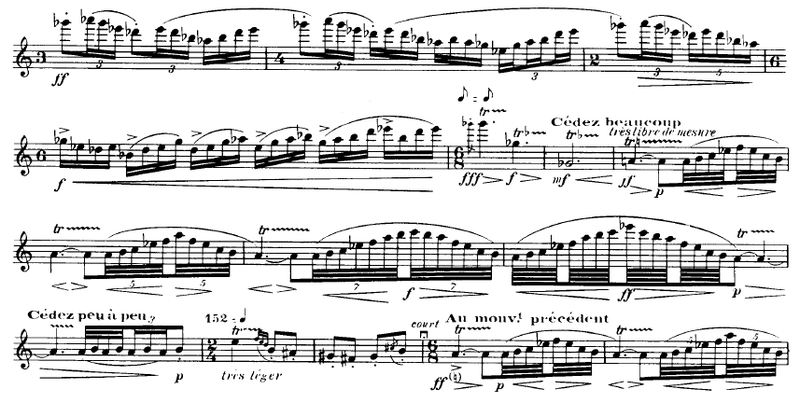 A challenging piece may require extreme dexterity of lips, fingers, breathing, and rhythmic division of notes, all while trying to coordinate with other instruments. If you try to do it all at once, you might impress some people, but you will not accomplish as much as you could with simple, careful analysis and practice, putting parts together in a conscious and efficient manner to make a well-executed and brilliant performance. It is the same with all instruments, including the voice. Although vocal music doesn’t usually contain the rhythmic and range extremes of the example above, we have other challenges, especially with lyrics. The ever-changing shape and action of the vocal tract in order to form words is every bit as much of a challenge as the finger and embouchure gymnastics that the instrumentalist faces. On top of that we may have foreign languages (for classical singers), and awkward rhythms and intervals that we cannot approximate by pushing keys. 1. Learn words as speech. 2. Learn rhythm with counting (no words). 3. Say words with correct rhythm. 5. Integrate and sing, phrase by phrase. Steps 3 through 5 are not negotiable for young people. Step 1 is essential for foreign languages. Step 2 is necessary for complex rhythms. Step 2 is unnecessary for styles passed down by rote. Accomplished musicians can sometimes combine or skip steps, but they usually became accomplished by working in a methodical way of some kind. Some songs have more complex intervals and melodies than lyrics, so the steps could be 4, 5, 1, 2, 3 in such a case. The main point is, there need to be steps! Some kind of efficient, unanxious, way of getting from zero to performance-ready so that the musical, textual, and technical elements of the material are mastered to the best of one’s ability. When doing the steps above, consider quantity and speed. Practice small chunks at a time with little breaks. Practice fast passages slower, and very slow passages a little faster, until the rhythms make sense. Of course there is a lot more to preparation than this, but this is a start in “getting the song learned”. After that, it’s ready for memorization, interpretation/acting, physical presentation, and work with accompaniment or an ensemble. Singers are notoriously poor preparers compared to instrumentalists. But it doesn’t have to be that way. Prev Who picks the repertoire, teacher or student? Great post. I am a vocal student of Claudia Friedlander’s. A few years ago I read “Talent is Overrated: What Really Separates World-Class Performers from Everybody Else,” where I was first introduced to deliberate practice. Engaging in this type of activity has been the key in my rapid progress. Thank you for your comment, Chandra Roxanne. How lucky you are to have such a fine teacher to study with, and congratulations on your progress!